H.E. 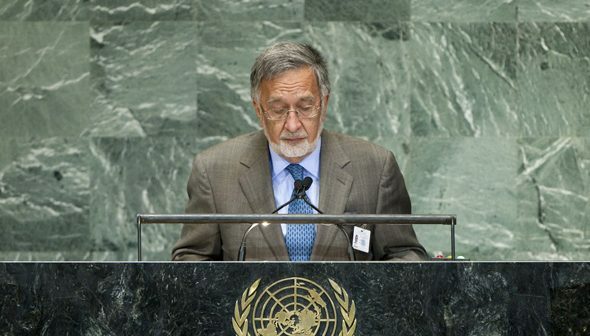 Dr. Zalmai Rassoul, Minister for Foreign Affairs of Afghanistan, addresses the General Assemblyâ€™s High-level Meeting on the Rule of Law at the National and International Levels. I bring you all the warm greetings and good wishes of the Afghan people. 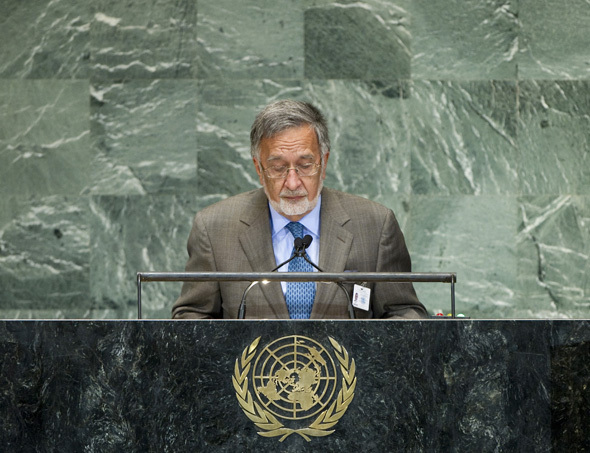 I have the honour of addressing this august assembly in the last year of the current elected government of Afghanistan, so I think itâ€™s useful to briefly revisit the story of Afghanistan over the past twelve years â€“ our historic successes and our concrete achievements that have transformed Afghanistan, and, yes, the challenges that weâ€™ve faced continuously during this time. Following on that, Iâ€™d like to share with you the vision of the Afghan people and government for the future of freedom, dignity, prosperity and democracy that weâ€™re striving to solidify in our country, and briefly address the critical importance of our relations and cooperation with countries in our region and the broader community of nations. To better illustrate the journey that Afghanistan and its noble people have been on over the past twelve years, Iâ€™d like to share two contrasting pictures of the reality of Afghanistan, in the year 2001 at the time of the collapse of the Taliban regime and the year 2013 as weâ€™re going through a historic period and process of transition. During the little more than two decades up to November 2001 when the Afghan people ousted the Taliban regime from power with military backing from the US-led international military coalition, the people of Afghanistan had experienced and suffered incalculable pain, deprivation and losses through three distinct periods. Between the communist coup in 1978 and the subsequent invasion of our country in 1979 and the fall of the communist regime, more than one million Afghan men, women and children were killed, more than two million were made orphans or left with severe war wounds and over five million were forced out of their villages and towns into refugee camps in neighbouring countries, mainly Pakistan and Iran, as a result of the brutality of the occupation and the communist regime and during our resistance against the occupation of our country. We fought that resistance â€“ our holy jehad â€“ for our freedom and independence and we won, in the process helping the national freedom and independence movements in Eastern Europe. The international community that had supported our struggle for several years abandoned us when the defeat and withdrawal of the Red Army became apparent. Exploiting the vacuum and internal strife created during the early 1990s, the foreign-backed Taliban movement rose to power The Taliban quickly controlled more than ninety percent of Afghan territory, but then equally quickly they removed their masks and revealed their true identity that held the Afghan nation hostage and unleashed a period of particularly cruel and barbaric violence and cruelty against them under the guise of Islam. Through their backward worldview, sheer violence and brutal suppression of the rights and freedoms of the Afghan people, especially women, they turned the country against themselves. The international community was only mobilized to take action against the Taliban regime in the wake of the 9/11 terrorist attacks in the United States, including in this city. At the time we were getting ready to drive the Taliban regime from power at the end of 2001 with military backing from the US-led international coalition, Afghanistan was in near-total dark isolation from the region and the world community. The Afghan people represented a terrorized population who had no rights, no freedoms and no protection from regime brutality. Severe poverty and disease were endemic with little or no access to healthcare services. The education system, completely excluding women and girls, and with fewer than half a million male students attending schools and universities, was a catastrophic failure. The average annual per capita income was about $100 and the country lacked a single national currency. Our roads, bridges, irrigation networks and other components of critical national infrastructure were completely destroyed. Afghanistan did not have a national army or a national police force and all our other state institutions had been reduced to rubble. In short, Afghanistan was a failed state ruled by a proxy militant group that provided shelter to international terrorists, thus posing a real danger to regional and international peace and security. The situation in Afghanistan during that period was indeed bleak. The Afghan people had little hope for their future and the future of their youth and children. However, following the Al Qaida terrorist attacks in the United States, the Afghan people came together and with support from the United States and a multitude of other friends and allies in the international community, removed the Taliban from power and embarked on a new era of hope, reconstruction, development and progress, a new era marked by an entirely different reality. Primarily as a result of our own sacrifices and the considerable sacrifices and support of our international friends and allies during our twelve-year partnership, Afghanistan once again the home of all Afghans â€“ men and women â€“ where they enjoy equal rights and freedoms under our moderate, democratic constitution. Today, Afghanistan is a forward-looking young democracy with functioning state institutions, an elected president, an elected parliament and elected provincial councils in each one of our 34 provinces, backed up by a powerful civil society movement. Afghan independent media â€“ with around 50 independent TV channels, over 100 community FM radio stations and hundreds of print publications â€“ is arguably one of the freest in the region. Today, there are more than 20 million mobile phone users across Afghanistan, an increasing number of them accessing information and using various platforms on the internet. Per capita income has increased from $100 a year to over $600 a year, our national currency has been consistently stable, and our trade ties with the outside world are rapidly expanding. Today, in this new Afghanistan, the number of children that attend school stands at well over ten million, 40 percent of them girls, and there are hundreds of thousands of young men and women attending some 70 government and private colleges and universities. More than seventy percent of our people today have access to basic healthcare services, which, among other things, has increased average life expectancy from around 40 years to above 60 years in just one decade. We have built thousands of kilometers of roads, irrigation canals, bridges, and other pieces of our countryâ€™s critical physical infrastructure, thus cutting travel times and facilitating trade and the movement of people through the country and with neighbouring countries. Afghanistan today is a proud and active member of the international community while managing our ever-expanding relations and cooperation with countries and organizations around the world through a network of some seventy diplomatic and consular missions. The examples of rejuvenation and development, progress and achievements that I just described represent the true picture of the reality in todayâ€™s Afghanistan. And considering that twelve years is not a very long time in the history of a country, especially a country like Afghanistan that has gone through more than 35 years of war and destruction, these achievements and gains are nothing short of a historic transformation. I have drawn this clear contrast between the Afghanistan of ten years ago and the positive reality of today for two main reasons. One, to underscore a model of collective action and international cooperation in support of national efforts for peace, security and development in a country, and, two, to counter a narrative of doom and gloom for Afghanistan by those who are ignorant about our progress or harbour ill will towards us. Indeed, this new Afghanistan is currently going through a critical period of security, economic and political transition that comes with its difficulties and challenges but that is helping us consolidate our fledgling democratic order and strengthen our national sovereignty, independence and ownership of our own affairs. This is the vision of the Afghan people and government for the years leading up to the completion of transition in 2014 and into the Transformation Decade of 2015 to 2024. In the security area, it is our more than 350000 brave and professional soldiers and police officers â€“ not foreign soldiers â€“ who are directly responsible for the security of more than ninety percent of the Afghan population. The transfer of security responsibilities from international forces to Afghan national security forces, which we launched in the summer of 2011, throughout the country will be complete by the end of 2014. Our forces have demonstrated their courage, commitment and effectiveness in successfully taking over from their international partners. It is through the enormous and selfless sacrifices of our proud and patriotic national security forces on a daily basis that security in most cities and towns that have gone through transition has improved, and the Taliban have been beaten back. We are fully confident that with the continued financial assistance of the international community for equipment and other requirements and needs as pledged at the Chicago NATO Summit in May 2012, Afghan national forces will be able to provide security to the Afghan people and defend the country against external threats. Parallel to our ongoing efforts to enhance the capacity and capabilities of our national security forces, the Afghan government is pursuing a political process of peace and reconciliation with the Taliban. The key principles and conditions for this process are clear: respect for Afghanistanâ€™s constitution, which guarantees full and equal rights to Afghan men and women, preservation and improvement of our achievements over the past decade and renunciation of violence against the population. The Islamic Republic of Pakistan, a major neighbour, can play a key role in supporting our peace efforts. Weâ€™ve been heartened by the recent successful visit to Islamabad by President Karzai and the positive and constructive dialogue that took place between the two governments during that visit. We look forward to further steps and progress in the weeks and months to come. As far as the economic component of transition is concerned, the presence of a large international military force over the past ten years has generated employment and income opportunities for thousands of our citizens, so it is natural that there will be an adverse impact resulting from the withdrawal of these forces. In addition to our best efforts to realize Afghanistanâ€™s role as the trade, transit and economic integration roundabout in the Heart of Asia region to the benefit of all the peoples of the region, the Afghan government is keen to reduce the negative economic impact of international military withdrawal and to strengthen our national economy in at least three ways. First, by focusing on the development of the agriculture and agribusiness sector where over 70 percent of our population is directly or indirectly engaged, and where there is enormous potential for growth and employment generation. Second, Afghanistan is estimated to hold trillions of dollars of natural resources, including minerals and hydrocarbons, representing a guaranteed source of wealth and income for generations to come. We already have several state-owned and private companies â€“ from China, India, the UK, Canada, Turkey, the UAE and other countries in addition to Afghan companies â€“ expressing a keen interest in investing billions of dollars in copper, iron ore, gold, oil and gas. And weâ€™re actively seeking additional foreign investments into this sector while remaining duly diligent to make sure our natural riches serve the goal of a strong legitimate national economy and improved prosperity and welfare for the Afghan people. Third, the Tokyo conference last July pledged over $16 billion through 2015 to help the Afghan government fill its projected fiscal gap. Conference participants also committed to provide additional financial assistance to Afghanistan beyond 2016 at or near levels of the past decade. This generous financial support will be critical in tiding us over during the next few years. In addition to the security and economic transitions, we have a crucial political transition coming up next year, namely presidential and provincial council elections. Next yearâ€™s presidential elections will mark the first time in our countryâ€™s history when one elected president will transfer power to another elected president through a peaceful, democratic process. The Afghan government is doing everything possible to ensure free, fair and credible elections so that the Afghan people can choose who the next president will be. A successful presidential election will entrench our democratic process and greatly contribute to our efforts towards lasting peace, security and prosperity. As we go forward in implementing the transition agenda and preparing for the Transformation Decade, another key foundation of our long-term success will be the strategic partnerships we have forged with some of our closest friends and allies over the past few years. Since October 2011 when we signed our first long-term strategic partnership agreement with the Republic of India, we have entered into similar long-term strategic partnerships with the United States, Germany, Australia, France, the United Kingdom, Italy, Norway, Finland, Denmark and Poland. Weâ€™ve also concluded or are currently negotiating similar partnerships with the European Union, Turkey and the United Arab Emirates. Here, I would also like to repeat the Afghan government and peopleâ€™s appreciation for the solid and broad-based expression of long-term political support for a peaceful, prosperous, democratic Afghanistan by more than 100 countries and organizations at the historic international Bonn conference kindly hosted by the German government in December 2011. Specifically with the United States, we are also negotiating a separate Bilateral Security Agreement that will define the parameters of the long-term security and defense cooperation between our two countries. I would also like to reiterate our long-standing principled position that any bilateral security agreements Afghanistan signs with other countries, including the United States, will only be for the purpose of ensuring peace, security, development and the consolidation of our young democracy and not directed at our neighbours or any other country in the region. Afghanistan belongs to its region. And as recent history has clearly demonstrated the peace, security and stability of Afghanistan as the centre of the Heart of Asia region has a direct impact on the peace, security and stability of the entire region and vice versa. We want Afghanistan to serve its rightful role as the key land bridge in our vital region for the flow of people, goods and investments. In this context, the Istanbul Process that we launched together with our Turkish friends and all other participating and supporting states of the process in November 2011 for confidence building and promoting result-oriented cooperation is vital importance. Two follow-on ministerial meetings â€“ in Kabul in June 2012 and in Almaty in April this year â€“ have taken the process to the level of maturity. It has now developed into a meaningful forum for discussion on specific confidence building measures and enjoys considerable momentum. As the permanent co-chair of this process, the Afghan government is particularly grateful to the Peoples Republic of China for hosting the next ministerial meeting next summer. In addition to improving cooperation and confidence on a whole range of other issues, all countries in our region and our allies and friends in the international community must continue to decisively confront the single biggest challenge that continues to endanger our collective peace and security and undermines the welfare of our people, namely the continuing menace of terrorism and extremism and their sanctuaries and support systems in the region. We will not realize the full potential of our citizens or achieve true and lasting peace and security in Afghanistan or the wider region until weâ€™ve dealt decisively against the brutality and evilness of the terrorists who try to harm us everyday. Fortunately, weâ€™re more hopeful now than in the past about a gathering common approach against terrorism and extremism in our region. This yearâ€™s general assembly takes place at a time in which the UN has seen a number of conflicts continue, while new ones have taken shape. In Syria, we watch the ongoing immeasurable suffering of the great people of that country. Afghanistan calls for an immediate halt to the violence there that has taken the lives of over a hundred thousand people, has forced over 2 million Syrians to become refugees; and has left 6.8 million people in urgent need of humanitarian assistance. We strongly support a political solution, reached through a broad-based national dialogue that meets the aspirations of all Syrians. Moreover, the international community must provide necessary support to address the humanitarian needs of those affected by the conflict, including the millions who have sought refuge in neighboring countries. Speaking of long-standing conflicts, none is more evident than the decades-long strife between Palestine and Israel. Following years of deadlock and impasse, we see renewed efforts for a peaceful settlement have emerged with the resumption of direct negotiations between the two-sides. This is an important development, which we hope will result in durable peace, enabled by the establishment of an independent Palestinian State. We also hope to witness the inclusion of the State of Palestine as a full member of this organization. In conclusion, Mr. President, as I stand before this assembly, I feel more strongly than ever before that our shared vision of a world free from violence, conflict and destitution will only be achieved if we put our differences aside, and act as one. If we adhere to the principles of understanding, solidarity and cooperation, we will be able to secure our collective future, as evidenced in the historic successes we have achieved in Afghanistan over the past twelve years. The UN has been a reliable partner in helping us come this far. As we prepare to embark upon the Transformation Decade, we expect the organization to continue its support through a renewed approach that reinforces Afghanistanâ€™s leadership and ownership. Let me also assure you, Mr. President, that as we in Afghanistan work to preserve our gains and consolidate our young democracy in the crucial years ahead, we will remain an active member of the United Nations.